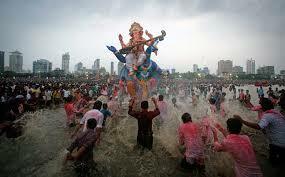 Vinayaka Chavithi ~ Amazing ..!! Lord Vinayaka is said to be the most powerful gods in Hindu Mythology. He is also known as Siddhi Vinayaka, Ganesha. He is the lovely son of Mighty Lord Shiva and Goddess Parvathi. He is the brother of Kumaraswamy/Karthikeya. Lord Ganesha have 2 wife's siddhi and buddhi. Lord is most identified because of his elephant head. He is the remover of Obstacles in any new Beginnings and hence Hindu's before starting any new work make the Puja of Shri Siddhi Vinayaka with a bless to have "Avignamasthu". This is even before performing any other Puja's too. This is performed with making Vinayaka with some turmeric powder. 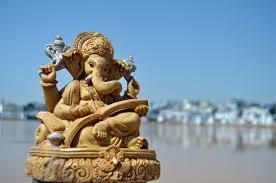 Lord Ganesha, has written “ Mahabharatha” when sage ‘vyasa’ asked him to transcribe as he dictated it to him. Lord agreed with a condition that it should be uninterrupted and never be paused till complete. When the lord was writing uninterruptedly his feather pen broke. To write without interruption lord broke his tusk and used it as pen so that the transcription could proceed. Once there lived a demon king Gajasura ( An Asura with elephant characteristics), he performed a deep penance to get boon from the mighty god Shiva. Pleased with the penance of the demon, lord appeared before him and asked his wish. Demon wished that he could generate fire continually from his body so that no one can come near him. Lord gave the boon and fulfilled his wish. But, the demon Gajasura didn’t stop performing the penance. When Lord re-appeared to ask his wish one more time. He asked lord shiva to live in his stomach. Lord agreed. Goddess Parvathi, wife of lord shiva in a worry approaches lord Vishnu on knowing the grant of this wish. Lord Vishnu, assures her of bringing the Mighty lord back. He initiates a cosmic game by transforming the bull of shiva, Nandi into a dancing bull and himself as a flutist. Together they impress the demon. Demon asks them to make a wish when lord Vishnu asks to liberate Lord shiva from his stomach. Demon Gajasura, understanding that the flutist is Lord Vishnu himself asks him for satisfying two of his wished before he die. One among is “Everyone should remember me adoring my head” and the other is “You should wear my skin”. On accepting the wishes of demon, lord is liberated from his stomach and demon dies. Knowing about the return of Lord Shiva, Goddess Parvathi wishes to give a warm welcome to her husband. To get ready she was preparing for bath. She didn’t wish to be disturbed by anyone while getting ready. So, she takes the turmeric paste from her body and moulds to a statue. She breathes life into that statue and names him as Ganesha, her loyal son. Doing so goddess went away for bath. Lord Shiva returns at the same time. Seeing at the new charming face of the kid at his place surprises him. When he wishes to go inside he get interrupted from Ganesha . Lord explains himself as husband of the goddess. Ganesha takes his blessings but still doesn’t allow the mighty lord inside. Lord Shiva in Anger orders his army to destroy the kid. When the kid defeats the entire army of lord shiva. Being the son of devi herself he remains undefeated. Lord Shiva stands surprised for his courage and strength. Deciding that Ganesha is no ordinary kid he decided to fight himself. Lord Shiva in his fury of fight cuts the head of Ganesha and kills him. Goddess Parvathi, knowing the destruction of her husband moves in anger and takes the form of DEVI Kalika. She decides to destroy the entire creation as her son was killed. God Brahma, who is the creator stops her and asks to re-consider. 1. Ganesha to be brought back to life. 2. Ganesha to be worshipped before any other god. Her boons were accepted by Lord Brahma and her husband. Lord SHIVA sends his army to bring the head of the first creature which is laying with its head facing north. Shiva’s army bring the head of Gajasura who layed dead as first creature in their way. Lord Shiva places the head of Gajasura and Lord Brahma breathes the life into him. Lord shiva declares him as his own son and leader of all ganas ( classes of beings), Ganapati. One day, lord Shiva was offered for a feast from Kubera. Lord Shiva asked him to serve Lord Vinayaka instead of him. Kubera served Lord Vinayaka with great devotion and respect. Lord Vinayaka had his appetite more than required and reached mount kailash. Lord Vinayaka was short, with his elephant head and big stomach. He was not able to walk and his stomach broke open. Goddess Parvathi ties his stomach with snakes. when the Moon god looks at him and laughs. Looking at this in anger, lord curses moon,” whoever sees you will be not believed by anyone and unknowingly gets screwed on unknown issues”. Listening to this moon starts pleading for mercy and remedy near Lord Vinayaka. Pleased Lord, forgives him and withdraws his curse saying,” whoever sees you on my birthday i.e., “Badrapadha sukla chavithi” without performing Vinayaka Chavithi vratham will be applicable for this curse. Moon god with a happy heart performs the puja and gets all the benefits. In dwapara yuga, Lord Krishna have seen the face of moon in milk and gets blamed for killing the Prasena. Understanding his mistake Lord Krishna performs the Vinayaka Chavithi puja and proves himself innocent. He married Jambavathi while proving his innocence and Satyabhama later to proving his innocence. He is also given with Samanthakamani which is the cause of this blame. During this festival, lord vinayaka’s idol made of clay, gold, silver etc., based on our effort needs to be used. He has to be devoted with his favorite Lotus flowers and served with different types of sweets and food items. This festival is celebrated for 10 days starting from his birthday. The last day with more celebrations the idol is immersed in a nearby river or sea with all respect.